New rules for magical polymorphing, environmental template grafts to modify creatures to fit any world on the fly, and more! 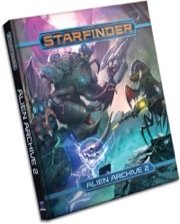 Note: This product is part of the Starfinder Roleplaying Game Subscription. Better than Alien Archive in every aspect. Better illustrations, more content (also due to the fact that the monster creation rules were already presented in the previous book) and more polished. The addition of the polymorph spell and mechanics is amazing and super fun. You have bought AA1 because it's good but mostly because you need it... Then, I promise you'll buy this AA2 because you will WANT it! I'm still absorbing it, but beyond lots of cool creatures it adds quite a few "base" creatures and template grafts. Alien Archive 1's charts are great if you have time, but if you need some quick stats mid session for, say, a void dragon t-rex, you have one in a minute or less. I really like the improvements to the appendix and wish that Alien Archive's was that good - for example, it is nice to have a list of playable races and what pages they are found on. Starship-scale foes are few, but it's nice to be able to kill the giant space worm and then make a ship out of it's corpse. Cool new races, cool Pathfinder monsters returning, new creatures for several outsider categories and cool new creatures. It also helps that things introduced in this are type of variety that is really helpful when running homebrew games, like having several "templates" for different alien animal types is great. It also has good balance of fantasy, scifi and both mixed in. Nice! Rules for playing as the thralls of Hell from Embroi! This is oddly one of the races I was most curious to play. Go figure. Do we know the pagecount yet? Seeing as its the same price as the last one I imagine page count would be similar sadly. Im all for more races and critters. Pack em in there!! Will each alien still get a full two page spread? 15 people marked this as a favorite. Each alien does receive two full pages, but like before, many of those spreads will have two (sometimes more) stat blocks for various CRs. And because we don't need to re-explain NPC creation, we had room for more total aliens in this one! Yay :D I like the two full pages format since it means creatures are actually detailed and its clearer what their place in the world is. Will this bestiary have any CR 21-25 creatures? !!! And ship sized creatures? Also, will we see a large section of flora and flora generation rules some time? My players are real scavengers and DIYers. McBugman, the description says "massive spacefaring organisms capable of battling starships"
sorry for not formatting correctly, I seem to have an issue with the "How to format your text" section. it isn't opening when I click it. Thanks, my excited reading seems to impede it's only purpose of reading. The cover looks like a Vracinea, will AP aliens be reprinted in this archive? Thanks, I always did like Divs. Although they are not as alien as Proteans, they are preferred over Devils (bunch of Lawful ninnies if you ask me). I guess they might reprint a few from Pathfinder, and maybe a few from the Adventure Path, but I hope they'll stick with mostly original creatures, at least until the third Archive. Let's start wondering about the description, shall we? Want to play an intelligent, multi-legged centipede? An emotionless, mask-wearing mollusk? and Uplifted Bear? Not gonna lie, I want to take that "uplifted bear" and make a character called "Yogi" or run around yelling "only you can prevent forest fires". Can't wait to see them. the centipede seems like an odd choice, but I'll roll with it, as long as it isn't tiny. and the mollusk just sounds awesome. Just in time for me to have birthday money to buy it with, although that means I have to wait 6 months (not including this month) and come back every weeks looking for possible questions that Jason or Owen might answer excitedly at 3 in the morning when the coffee pot has run out. On that note, here's hoping for Mattresses! those of you familiar with towel wielding earthmen and editors from Betelgeuse might know what I mean. Paizo knows what I like. Please, Paizo, reprint mi-go for Starfinder! I want to be able to canonically make by players relive that terror! I think we need to see Xenomorph or something similar. Also, polymorphing rules? What is that about? Removed a post and several replies to it. This is a discussion thread for Alien Archive 2, discussion of Pathfinder 2 does not belong in this thread. Just thought of something. J, Q, X, and Z have a noticeable lack of Aberrations (alphabetically speaking... using both Pathfinder and Starfinder as reference). wonders if the Mollusks in the description are the Embri. must dig through the rest of the Core rulebook for further speculations. after I hibernate. I've used up three of my brains already by staying awake this late. Scrabble discrimination against my people! Please let there be a cat race in this one.... you have them in the lore of being in the veskarium. I really wanna see the cat race. 17 officially designated "sentient alien species"
Paizo, please take all of my money. Just, like, all of it. Right now. ratcatbo, that would stifle the main purpose of the book, though. namely that DM/GM's are the intended users of the book, with players as a secondary market. if the races are separated from the other creatures, it would pose a significant problem in layout design, particularly in placement of redundant pages explaining why they changed the layout of their book series. besides, if the players use their knowledge of rules text in-game to kill a monster/NPC their character doesn't know about, you can just drop 6 great old ones on the party as "Divine Punishment for use of Metadata"
Are these uplifted bears bipedal humanoid aliens (a la how rats are to ysoki) or are these more just literally genetically modified super-intelligent bears (basically how morlamaws are just super-intelligent technicolor walruses)? They already exist as the Hive in Horror Adventures. Port 'em over and off you go. Uplifted Bears? From like Golarion? I honestly don't care I've been wanting to play a bear like race for forever now. Like Dickson's Dilbians. Let's hope they're on the upper end of Medium (if not actually Large) and have kind of a boisterous bruiser vibe. And, seriously: I'm looking forward to the dirindi, sazarons, and various Veskarium and Azlanti Star Empire subject species to the same degree that I was looking forward to the maraquoi. Or, to switch away from playables: more Castrovel critters and everything outside of the Pact system. I'm excited for this, but I'm MOST excited for the Armory book. Why can it not just be July already? You had me at uplifted bear. Also, with D&D re-introducing the Giff, I feel Starfinder could use some interplanetary pachyderms. Could be rhinos (like the Judoon) or could be elephants, or hey maybe it could be hippos. Please consider. We know that Starfinder and PF2 share a fair bit of design overlap. In light of some of the info coming out of this thread, do we think Starfinder polymorphing might be similar? Will this reprint the Alien Archive sections from Dead Suns 1-6 (like the Pathfinder Bestiaries reprinted creatures from older AP volumes)?